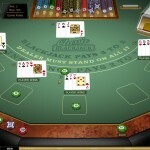 Multi Hand Classic Blackjack Gold is quite an entertaining and a rewarding blackjack game and as the game implies, it is the Gold edition of the Multi Hand Classic Blackjack. 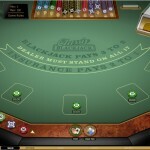 The game offers players a classic game of blackjack with an exciting twist. In normal Blackjack games, players will only play with one hand that they can split in two or three hands but in this game, players will begin with up to five hands that they can split into more hands. This gives players more chances of beating the hand of the dealer and more than once chance to recover from the loss of one hand by winning the rest of the hands. Multi-Hand Classic Blackjack Gold is a unique Blackjack version. This game is also powered by Microgaming and it gives players the chance to double, triple and quadruple their winnings by playing with more than one hand against the single hand of the dealer. In this game, players can play with up to 5 hands. Players can choose to play with 1 hand, 2 hands and up to 5 hands. Players will activate the hands they want to play with by placing a chip on the wagering area that is specified for each hand. Players will select a chip size and they will place it and click on deal. Players will play with each hand separately from the other. They will be asked to hit or stand on every hand. They will also get other in gaming options such as splitting, re splitting, placing insurance and doubling down. Players can only double down on hard 9, 10 and 11 and they can split each hand once to form two blackjack hands. Since the game allows players to play with 5 hands, there are five different card decks in play. The dealer will have to stay on 17 and there is no peaking allowed. Since the game is powered by Microgaming, it means that players can enjoy an authentic and an ultra realistic gaming experience that resembles real land based blackjack games. The software developer achieves that by offering players the same table layout of land based casinos where they can enjoy a visually captivating experience while enjoying the casino background noise that they can hear at any casino. Everything about the game looks realistic, starting from the green table, the cards to the chips and the chip rack. Like any Blackjack game, players will have to start by placing their initial stake. Players will place the stakes by clicking on of any of the available chip sizes then placing them in the betting area. Players will see five betting areas, they will only place the chips on the hands they wish to play, so they can choose to play one hand, two hands up to five hands against the single hand of the dealer. The available chip sizes are found at the bottom left side of the screen. The sizes available are 5, 10, 25, 50, 100, 200 and 500. Players can place up to 500 credits per hand, which makes for a total of 2500 for the 5 hands. This is why this game appeals greatly to the high rollers, this is why it is called the Gold edition. After players place the bets on the hands they want to play, they will click on the Deal button. The dealer will start dealing players 2 cards for each hand they activated, the two cards will be facing up. He will then deal himself two cards, one of them is facing up, and the other hole card is facing down. Players will then play each hand alone, they will take decisions such splitting, if they get identical cards, hit if they need more cards and stand when they are satisfied with their hand’s total before moving on to the next hand. Players can double down on hard 9, 10 and 11.